I noticed that a small tub of sour cream I'd bought was going to expire this week, so I had to either freeze it or get baking. Since my solution is usually to freeze the leftovers of whatever batch of cookies, muffins, meatballs, dough or anything else I might not use before it goes bad, our freezer is pretty full. I'd originally bought the sour cream to make sour cream coffee cake from a much loved and abused cookbook. The poor thing is just over 10 years and already the spine is falling apart. This is why the HP Touchpad tablet is a great thing for the kitchen. I'm less apt to spill something on it because Chris has cleverly placed it away from surfaces I bake on. Anyway, I made half a sour cream coffee cake (I only had half the sour cream required). 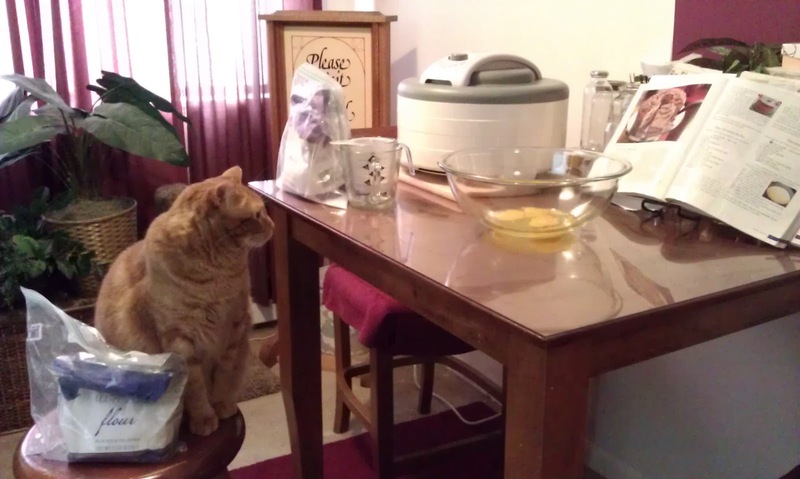 The cat was very excited. 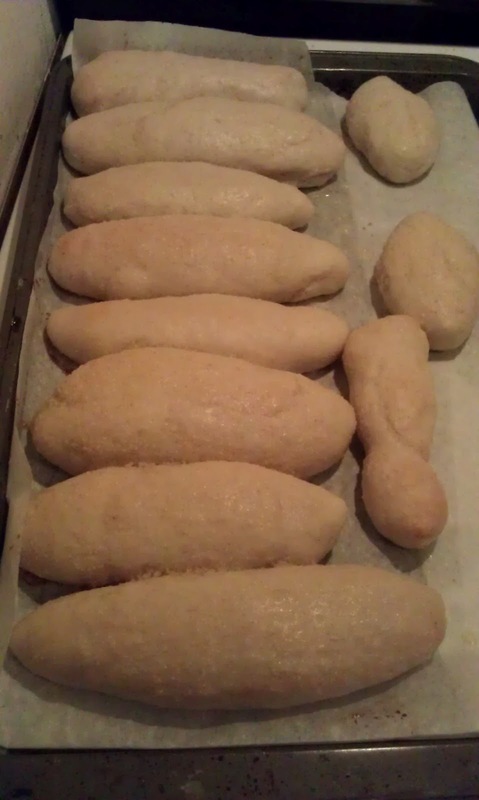 While I was at it I decided I'd make some tasty olive garden copycat breadsticks for dinner. If not for the magic of people pinning things on pinterest, I might not have discovered this delicious recipe. I've tried a lot of copycat recipes over the years for various things and not all of them are any good so it wouldn't have even occurred to me to search for such a thing. I tried my hand at one last thing. 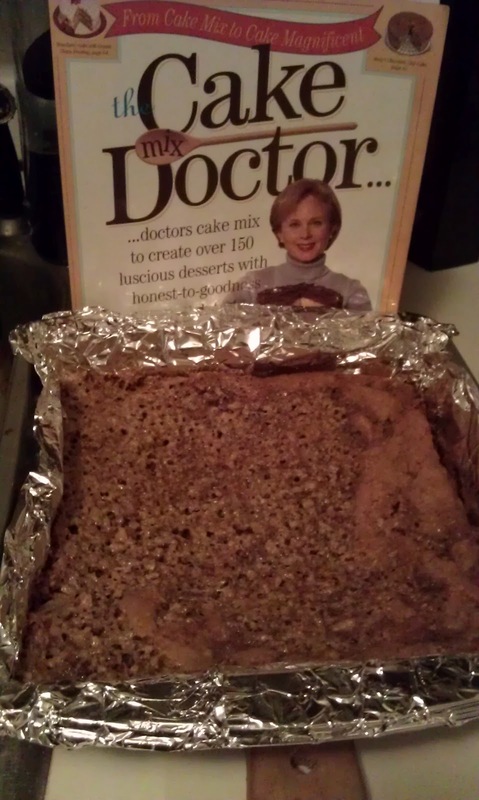 A co-worker loaned me her Cake Mix Doctor cookbook. Basically you take a box of cake mix, add some other things, and voila, you have a more awesome tasty cake than what the box recipe calls for. The cake you're looking at there? It's a pecan pie bar cake. Why does it look so funky? 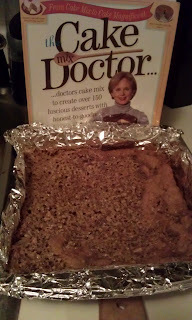 Because I have no patience and didn't wait for the initial layer of cake to cool before adding the topping coat. I can assure you though, the cake was tasty just the same. Amidst all this baking I never made biscotti. I've been craving some the last few weeks and told myself I couldn't buy any I had to make some. So after all this baking I was too lazy to start in on a biscotti recipe.